After work on Thursdays in Trinidad has gotten something new with the instalment of Thrive International's #ThriveINLime networking event. This event which has been happening every Thursday at The Chancellor Hotel since the 5th of July was created to allow persons in the creative fields to connect, collaborate and create. Thrive allows others to showcase their talents, be inspired by industry talks and be discovered. The event brings a different focus each week which keeps it fresh with an element of fashion, art, media and entertainment happening at least once a month. Started first in Dubai 5 years ago, this industry concept is building momentum with interest already to bring it to south Trinidad soon. Founder Ethan Auguste who is based now in Geneva after living in Dubai for 8 years is here in Trinidad working on developing the concept, brand and the 4th annual #ThriveINTNT event to be held in October. " I'm very pleased with the growth so far and see a lot of potential with this event here in Trinidad. It takes a few months to build a night so we are in it for the long haul." Ethan mentioned. "The event is free for all to enjoy after work from 6 pm - 11:30 pm and can only be possible due to the support of our sponsors Chancellor Hotel, MK Entertainment, Native Caribbean Foundation and Hierographics. " he continued. 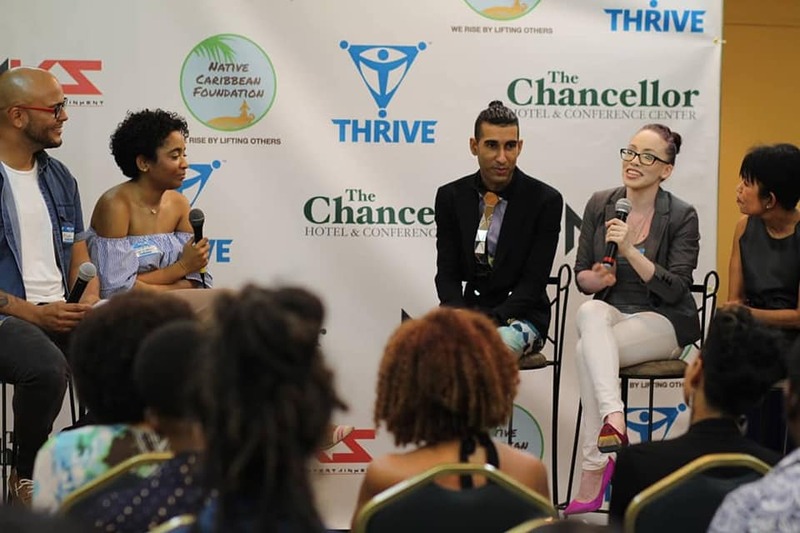 So far, ThriveINLime featured talks in fashion with Darcel De Vlugt, Claudia Pegus and Kyle Matas, Film with Danielle Dieffenthaller, Lisa Wickham and Michael Mooleedhar, followed by Art with Israel Silva, Nadya Shah and Japan-based Trinidadian Dexta Mega. This coming Thursday the 26th July, ThriveINLime will focus on music with industry talks from Beever Henderson, Kit Israel and Maarten Manmohan hosted by Mark Wallace also for the first time live bands will grace the stage. To get involved, showcase your talent or brands email ethan@ethanent.com for details and visit www.thriveintnt.com.